I’ve been a little obsessed with rearranging the built-ins in my family room for awhile now. It all started when I read a blog post by a friend and she was paring down and simplifying hers, and all of a sudden, mine felt way too busy. I had a lot of red and black accessories because those were the accent colors in the room at the time, and I just wanted it out of there! So about a year ago, I got rid of all the red and black and decided to have mostly neutrals. But then a few weeks later, I decided on the re-do of the room with blue as the accent color (you can read my post on that here), and I ended up buying a few blue items to add to the shelves. Well, now I’ve been re-doing the built-ins again! In this rearrange of the built-ins, I decided to go really neutral and have only things that are white/cream or natural items like iron and wicker. I should’ve never run out and bought blue items, especially since I haven’t even re-done the room or found the right blue fabrics yet (story of my life!) I am still planning on re-doing the pillows and drapes, but I started thinking, what if the fabric I find ends up being green instead? Or even blue and greens? I will have backed myself into a corner with the blue decor items the same way I did with the red and black! So yesterday, I decided to remove the blue and keep only the neutrals and whites. And I love it so much better this way! 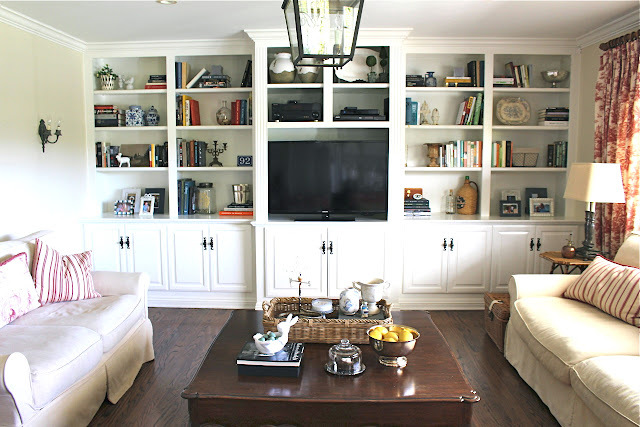 Here were a few of the rooms that inspired me in the first place….. This is the photo that started me on yet another re-do of my shelves! Of course, this one has only cream (including books) which Mr. Maison has said I cannot do! I do love it though. This one is a little too empty for me, but I love the symmetry and the fact that the accessories are “no color”; only silver, black, and natural. 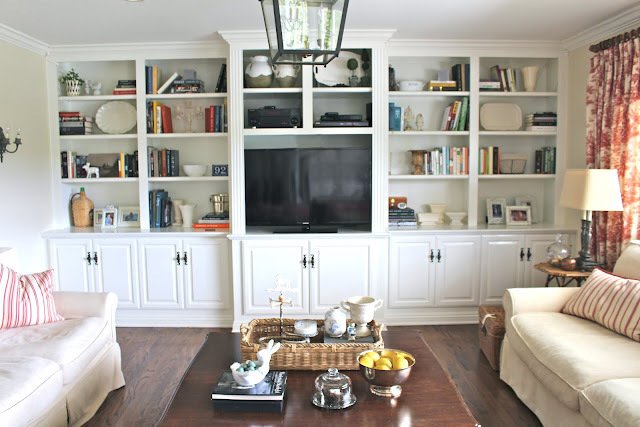 I showed this photo before, I know, but their neutral mix on these shelves is perfect. Not all cream, but just about. 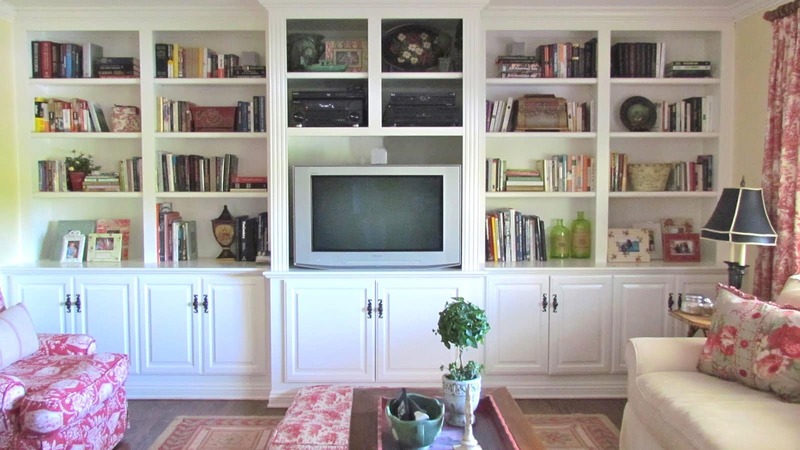 Before: Here is where my built-ins were before I started yesterday…. After: I used only white dishes and ironstone, both old and new, wire baskets, some white cast iron vintage pieces, and I changed the frames from a mix of blue and white to all white. I will still do some tweaking, but so far, I’m loving the softness it brings. I love the calm that simply changing out the items to neutrals and whites brought to the space. 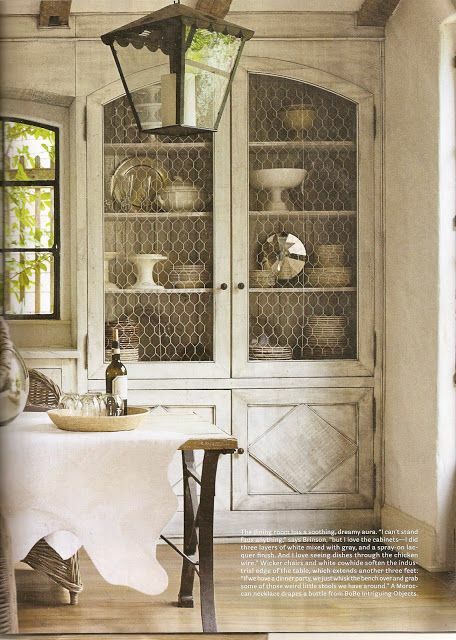 I’ve allowed for some natural items like rattan, silver or iron, but other than that everything is white or creamy white. It is so much less busy! I would love to change the books out as well, but as I said, Mr. Maison is not on board with that yet! Yellow walls, more black and red accessories, old coffee table, and original TV! 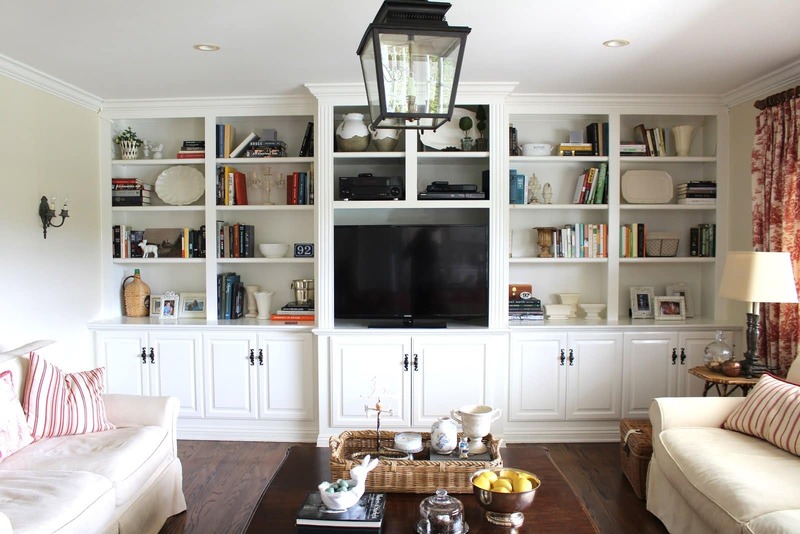 If you are looking to create a similar look in your built-ins or even free standing bookcases, inexpensive white platters, bowls and vases can be found literally everywhere. A lot of mine are from Home Goods or TJ Maxx which I’ve mixed with my antique ironstone. I also have some from other big retailers like Pottery Barn and Williams Sonoma. I’ve shopped a little for you and found some great ones, as well as some other vintage items and baskets. And don’t forget to mix in some vintage pieces; they can be found on Ebay or Etsy quite inexpensively. (*Please note: some affiliate links added for your convenience). 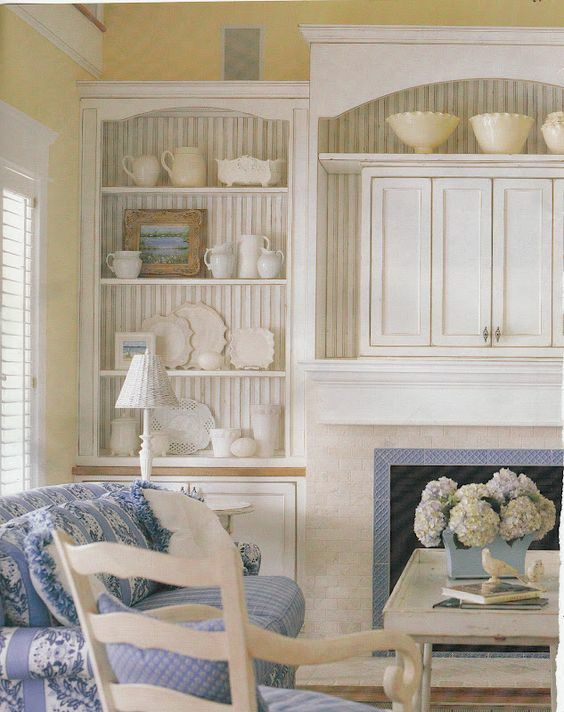 Love your bookcases but also love your chairs! Can you share where you got them? Thanks so much Susan! My chairs are from a local store in Los Angeles called Sofa U Love. I don’t know if they sell online or ship, however, they have about 5 stores in Southern California. 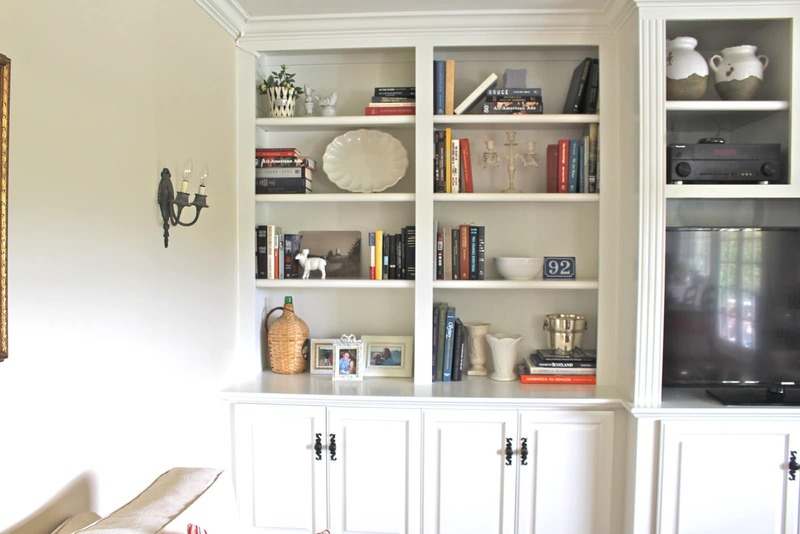 I like your bookcase… it's so much fun rearranging bookcases.. there are so many beautiful photographs of bookcases on the internet. I agree with Kelly above, I would paint the tv cords to match the back paint color on the wall! oh, I like your lantern chandelier too! Thanks Kelly! I've never thought of painting them, that's a good idea. It is on my "to do" list to have an outlet added at the back so they will be invisible. We did that upstairs and it looks sooo much better! Thanks for your sweet words! Love what you have done! I know that you have lots of special items there!!! 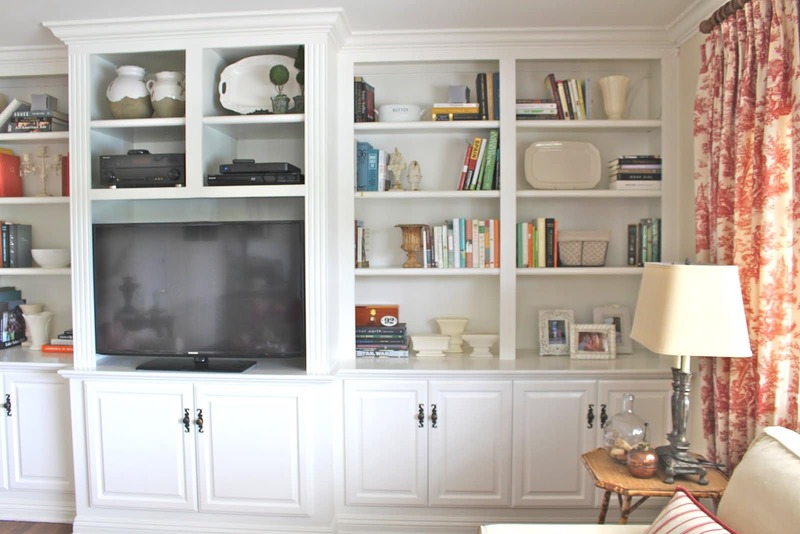 My only suggestion and I have done in another room is paint your tv, electronic cords the same color as the built in/wall. A detail that you will love and so easy! 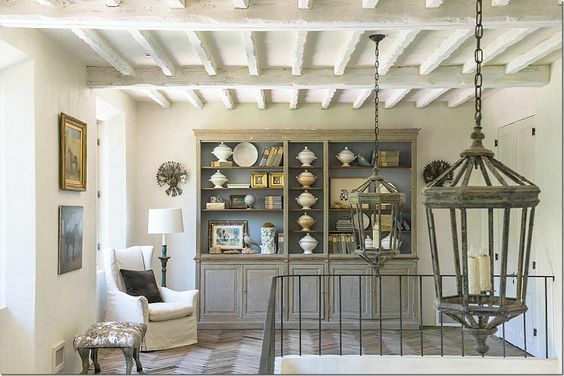 Love this room as you know! ? Of course, I couldn't agree more! I didn't go out and buy anything new. Everything that is here I already owned (and loved) as I've been collecting ironstone for several years. I simply brought out some ironstone to replace the blue, and I love the result! I had to correct the typo! My only suggestion is that you collect things that MEAN something to you! Not by color; not by trend…..things that represent something you care about. Just my suggestion! Then they last forever; look good together….and make you happy looking at them! Not for effect….but for meaning and memories! Just a thought!! !